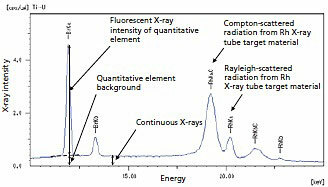 A standard sample is measured and the relationship with the fluorescent X-ray intensity plotted as a calibration curve, which is used for the quantitation of unknown samples. Although this method requires selection of a standard sample close to the unknown sample and creation of a calibration curve for each element, it achieves a high level of analysis accuracy. This method supports all types of corrections for coexistent elements, including absorption/excitation correction and correction for overlapping elements. This method uses theoretical intensity calculations to determine the composition from the measured intensities. It's a powerful tool for the quantitative analysis of unknown samples in cases where preparation of a standard sample is difficult. (JP No. 03921872, DE No. 60042990. 3-08, GB No. 1054254, US No. 6314158) The instrument offers both the bulk FP method for the analysis of metals, oxides, and plastics, and the thin-film FP method that supports composition analysis and thickness measurements of plating and thin films. A balance setting is required to use the FP method on principal components such as C, H, and O. 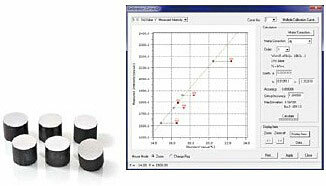 The software automatically sets the balance if it determines from the profile shape that a balance setting is required. The background FP method adds scattered X-ray (background) calculations to the conventional FP method, which only calculates the fluorescent X-ray peak intensity (net peak intensity). (Patent pending : PCT/JP2013/78002, PCT/JP2013/78001) This method is effective at improving quantitation accuracy for small quantities of organic samples, film thickness measurements of irregular-shaped plated samples, and film thickness measurements of organic films. The matching function compares analysis data for a sample with an existing data library and displays the results in descending degree of confidence. The library contains content data and intensity data and the user can register each type. The content data values can be entered manually. PCEDX Navi offers instrument initialization and startup (X-ray startup) with simple mouse-click operations. After instrument startup, the stabilization function operates for 15 minutes. Analysis and instrument checks are disabled during this period, ensuring that all users collect data in a stable instrument environment. 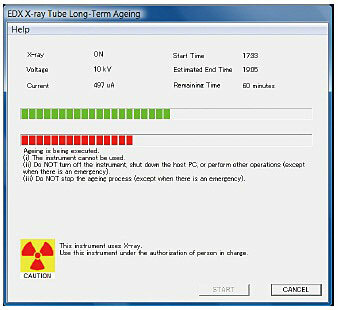 When an X-ray tube has not been used for a long period, it requires aging before it can be used again. The software automatically performs the appropriate aging according to the period of non-use. The software offers password protection. Condition settings and changes can only be made by a person who enters the password. 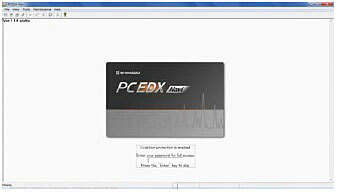 EDX-7000/8000 incorporates PCEDX Pro software that has more flexibility functions. 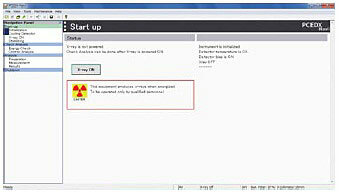 This software offers analysis, conditions settings, and data processing using familiar operations. 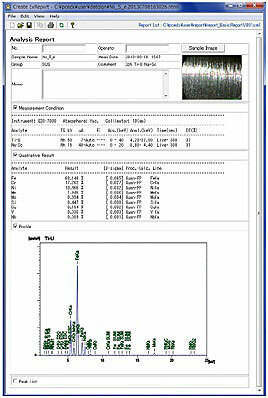 It also allows loading of data profiles and quantitation values acquired with a previous Shimadzu EDX series instrument. Analysis data reports can be created in HTML or Excel format. A variety of templates is available. The sample image automatically saved when measurement started is pasted in the report for confirmation of the measurement position. * Microsoft Office Excel must be purchased separately. 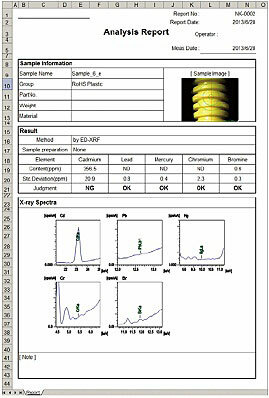 Lists of the analysis results for multiple samples can be created in Excel format. Data can be selected in the list for detailed display or editing. A variety of list generation templates is available, including a list of RoHS specific hazardous elements and user-defined lists of elements.